Noble titles: signore/signora = lord/lady; conte/contessa = count/countess; marchese/marchesa = marquess/marchioness; principe/principessa = prince/princess; duca/duchessa = duke/duchess; granduca/granduchessa = grand duke/duchess; re/regina = king/queen. 28 Aug 846 Arab raid against Rome. 28 May 1084 - Jun 1084 Normans sack Rome. rights of the Pope over the city of Rome. 1198 Duchy of Spoleto annexed (briefly under imperial rule 1222-1228). referred to as the "Babylonian captivity of the Church"
to restore the Roman Republic. 20 Sep 1378 - 12 Mar 1403 During the "Great Schism" rival (anti-)Popes rule from Avignon. 29 May 1434 - Oct 1434 Roman Republic declared in rebellion under the Banderesi. 25 Sep 1463 Fano Lordship annexed (confirmed 3 Feb 1520). 20 Nov 1465 Cesena annexed. 31 Dec 1494 - 28 Jan 1495 French occupation of Rome. 7 Apr 1504; Ravenna on 21 May 1509; and Faenza in May 1509). 3 Feb 1520 Fermo Lordship annexed. 6 May 1527 Imperial forces sack Rome. 17 Jun 1528 Rimini re-incorporated. 22 Jun 1692 Nepotism is outlawed in Papal Bull Romanum decet Pontificem. 10 Feb 1798 - 27 Nov 1798 Rome occupied by France. 15 Feb 1798 - 30 Sep 1799 In rebellion: Roman Republic. 27 Nov 1798 - 12 Dec 1798 Rome occupied by "Sicily" (Naples). 11 Jul 1799 - 28 Sep 1799 Rome occupied France. 30 Sep 1799 - 3 Jul 1800 Rome occupied by "Sicily" (Naples). 3 Jul 1800 Papal State (restored). 2 Feb 1808 - 17 May 1809 French occupation. into départements of Tibre (from 1810 Rome) and Trasimène. 17 Feb 1810 Rome is declared to be the second capital of the French Empire. 20 Mar 1811 Title "King of Rome" given to Napoléon I's infant son. 14 Mar 1814 Papal State (restored). 22 Mar 1815 Rome occupied by Naples (under Murat). 22 May 1815 - 7 Jun 1815 Austrian occupation. 7 Jun 1815 Papal State (restored). 26 Feb 1831 - 26 Apr 1831 In rebellion: United Italian Provinces. 1831 - 1838 Romagna occupied by Austria and France. 9 Feb 1849 - 4 Jul 1849 In rebellion: Roman Republic. 3 Jul 1849 - 3 Aug 1849 Rome occupied by France. 3 Aug 1849 - 7 Aug 1870 French troops garrison Rome. 1849 - 1859 Austrian troops garrison the Legations of Romagna and the Marches. 18 Mar 1860 Sardinia annexes Romagna (Bologna, Ferrara, Ravenna). and Pontecorvo (on 26 Dec 1860). 20 Sep 1870 Rome occupied by Kingdom of Italy. and city of Rome) by Italy. 7 Jun 1929 State of Vatican City, independent from Italy. Note: In several cases (1798-1799, 1800-1814, 1848-1849 and 1870-1929) Popes continued as heads of the Roman Catholic Church while in exile or in captivity, but without exercising temporal sovereignty over the Papal State. 15 Jul 1809 French département Tibre (Tiber). 17 Feb 1810 Renamed département Rome (Roma). 1814 End of French rule. 15 Jul 1809 French département Trasimène (prefecture Spoleto). 27 Nov 1798 - 12 Dec 1798 Occupied by "Sicily" (Naples). 11 Jul 1799 - 28 Sep 1799 Occupied by France. 30 Sep 1799 - 3 Jul 1800 Occupied by "Sicily" (Naples). 3 Jul 1849 - 3 Aug 1849 Occupied by France. it the Repubblica Tiberina (Tiberina Republic). 7 Mar 1798 Merged into Roman Republic. 26 Feb 1831 - 26 Apr 1831 In rebellion: United Italian Provinces declared at Bologna. 774 - 1093 Part of Papal State. 1093 Part of March of Ancona (Marca di Ancona). 1137 - 1177 Part of Papal State. 23 Jul 1177 Ancona a free commune (Comunitas Anconae)(under Papal protection). 25 Jan 1183 Autonomy re-confirmed. 1348 - 1355 Occupied by Rimini under the Malatesta. 1433 - 1443 Vassal of Francesco Sforza of Milan. 2 Sep 1443 Republic of Ancona (Respublica Anconitana). 20 Sep 1532 Annexed to the Papal State. 19 Nov 1797 - 7 Mar 1798 Anconine Republic (Repubblica Anconitana). 7 Mar 1798 - 14 Nov 1799 Incorporated into the Roman Republic. 14 Nov 1799 - 27 Jan 1801 Occupied by Austria. 27 Jan 1801 - 28 Jun 1802 Occupied by France. 28 Jun 1802 - 18 Oct 1805 Part of Papal State. 18 Oct 1805 - Jan 1814 Part of Italian Republic/Kingdom of Italy. Jan 1814 - 1 Jun 1815 Occupied by Kingdom of Naples. 1 Jun 1815 - 25 Jul 1815 Occupied by Austria. 25 Jul 1815 Part of Papal State. 757 Part of Papal State. 28 Jul 1273 Bologna a free commune. 5 Sep 1327 - 28 Mar 1334 Papal rule. 28 Oct 1350 - 15 Mar 1360 Sold to Milan. 15 Mar 1360 - 20 Mar 1376 Papal rule. 20 Mar 1376 - 1377 Autonomous Comune di Bologna (by revolt). 24 Feb 1401 Autonomy restored. 30 Jun 1402 - 17 Sep 1403 Occupied by Milan. 3 Sep 1403 - 12 May 1411 Papal rule. 20 Mar 1411 Autonomy restored. 14 Aug 1412 - 6 Jan 1416 Papal rule. 6 Jan 1416 Autonomy restored. 21 Jul 1420 - 6 Aug 1428 Papal rule. 6 Aug 1428 Autonomy restored. 25 Sep 1429 - 22 May 1438 Papal rule. 22 May 1438 Autonomy restored. 11 Nov 1506 - 23 May 1511 Papal rule. 13 Jun 1512 Annexed to Papal State. Feb 1790 - Mar 1790 Attempted revolution led by Luigi Zamboni. 13 - 14 Nov 1794 Second revolution attempt led by Luigi Zamboni. 16 Oct 1796 Part of Cispadane Republic (see Modena). 9 Jul 1797 Part of Cisalpine Republic (see Lombardy). 12 Aug 1799 - 28 Jun 1800 Austrian occupation (Regia Cesarea Provvisoria Reggenza). 12 Jun 1859 Papal Legate expelled, provisional government takes over. 11 Jul 1859 Sardinian administration. 8 Dec 1859 - 18 Mar 1860 Part of Emilian Provinces (Modena, Parma and Romagna)(see Modena). 18 Mar 1860 Sardinia-Piedmont annexes the Romagna (Bologna, Ferrara, Ravenna). 891 - 895 Byzantine rule. 1078 Part of the Papal State. 1418 - 1458 Occupied by "Sicily" (Naples). (b. 1474 - d. 1497), Duke of Benevento. 4 Jun 1768 - 23 Mar 1774 Occupied by "Sicily" (Naples). 19 Apr 1798 - 14 Jan 1799 Occupied by "Sicily" (Naples). 14 Jan 1799 - 24 May 1799 Occupied by France. 7 Apr 1799 Annexed to Neapolitan (Parthenopean) Republic. 3 Jun 1799 - 9 Apr 1802 Occupied by "Sicily" (Naples). 5 Oct 1801 Reassigned to the Papal State. 18 Feb 1806 - 31 Jan 1814 French occupation. 5 Jun 1806 Principality of Bénévent (French rule)(effected 2 Jul 1806). 31 Jan 1814 - 11 Jun 1815 Occupied by "Sicily" (Naples). 11 Jun 1815 - 15 Jul 1815 Occupied by Austria. the "Sicily" [Naples] Principato Ultra province). Province of Benevento to "Sicily" Naples which refuses. 23 Mar 1821 - 1821 Occupied by Austria. 3 Sep 1860 - 21 Sep 1860 Provisional Government in name of the King of Sardinia. 25 Oct 1860 Incorporated into Sardinia-Piedmont. 972 Comacchio part of the Papal State. 1254 - 1299 Occupied by Ravenna. 1303 - 1304 Occupied by Ravenna. 1309 - 1325 Occupied by Ravenna. 1482 - 1484 Occupied by Republic of Venice. 1508 - 1520 Occupied by Republic of Venice. 16 Jan 1598 Annexed, along with Ferrara, to the Papal State. 24 May 1708 Imperial (Austrian) siege begins. 15 Jan 1709 Pope grants Comacchio in pledge to the Emperor. 16 Sep 1724 Restored to Papal State. 20 Feb 1725 Imperial (Austrian) forces withdrawn. 888 Part of County of Capua. 1065 Norman rule, part of "Sicily" (Naples). 1105 - 1146 Possession of the Abbey of Montecassino. 1146 - 1230 Occupied by "Sicily" (Naples). 1230 - 1454 Possession of the Abbey of Montecassino. 1454 - 1460 Given in commenda to Ludovico Cardinal Scarampi-Mezzarota. 1463 Pontecorvo incorporated into the Papal State. (b. 1474 - d. 1497), Lord of Pontecorvo. which is raised to a bishopric. 4 Jun 1768 - Feb 1774 Occupied by "Sicily" (Naples). 1798 Occupied by "Sicily" (Naples). 1798 - 1799 Part of the Roman Republic (as a commune of Circeo department). 1799 - 1802 Occupied by "Sicily" (Naples). 1806 - 1814 French occupation. 5 Jun 1806 Principality of Ponte-Corvo (French rule). 21 Aug 1810 - 5 Dec 1812 Annexed by France. 5 Dec 1812 Incorporated into "Sicily" (Naples). Jan 1814 - Jul 1815 Occupied by "Sicily" (Naples). 5 Jul 1815 Restored to the Papal State. 5 Jul 1820 Rebellion ousts Papal governor. 4 Aug 1820 - 16 Mar 1821 Rebellion against Papal rule ("Republic of Pontecorvo"). 16 Mar 1821 - 1821 Occupied by Austria. 17 Sep 1860 Papal forces regain control. Sep 1860 - 8 Dec 1860 Occupied by "Sicily" (Naples) Borbone (Bourbon) forces. 8 Dec 1860 - 26 Dec 1860 Occupied by Sardinia-Piedmont. 26 Dec 1860 Incorporated into Sardinia-Piedmont. 25 Nov 1499 - 22 Oct 1503 Imola taken by Cesare Borgia. 19 Dec 1499 - 22 Oct 1503 Forlì taken by Cesare Borgia. 2 Aug 1500 - 1503 Cesena taken by Cesare Borgia. 10 Oct 1500 - 6 Sep 1503 Rimini taken by Cesare Borgia. 1500 - 1503 Pesaro taken by Cesare Borgia. 29 Apr 1501 - 19 Nov 1503 Faenza taken by Cesare Borgia. May 1501 Pope Alexander VI names his son Cesare Borgia, Duke of Romagna. 3 Sep 1501 - Sep 1503 Piombino taken by Cesare Borgia. Apr 1502 - 18 Oct 1502 Urbino taken by Cesare Borgia. 21 Jul 1502 - Oct 1503 Camerino taken by Cesare Borgia. Dec 1502 - 18 Aug 1503 San Marino taken by Cesare Borgia. Oct 1503 Pope Julius III confiscates Romagna. c.1165 Parma a free commune. 27 Jan 1311 - 6 Dec 1311 Under Imperial rule. May 1313 - Sep 1314 Occupied by Naples. 1315 - 1326 Part of Milan. 27 Sep 1326 - 5 Mar 1331 Parma under Papal State rule. 5 Mar 1331 - 18 Oct 1333 Under Imperial rule. 18 Oct 1333 Autonomy restored. 21 Jun 1335 - 22 May 1341 Parma occupied by Verona. 22 May 1341 Parma independent (under Azzo da Correggio). 11 Nov 1344 - 6 Dec 1346 Parma acquired by Modena. 6 Dec 1346 - 8 Mar 1404 Parma taken over by Milan. 8 Mar 1404 Independence restored (under Ottobono de' Terzi). 27 Jun 1409 - 25 Sep 1420 Part of Modena. 25 Sep 1420 - 15 Aug 1447 Part of Milan. 15 Aug 1447 Independence recovered. 27 Feb 1449 - 9 Apr 1500 Part of Milan. 9 Apr 1500 - 15 Jun 1512 French occupation (administered from Milan). 15 Jun 1512 Part of the Papal State (ratified by treaty 8 Oct 1512). 26 Oct 1515 - Nov 1521 French occupation (administered from Milan). Nov 1521 - 16 Sep 1545 Part of the Papal State. 5 Jun 1527 Imperial administration (not effected). 16 Sep 1545 Duchy of Parma created by by Papal bull (under Pier Luigi Farnese). 10 Sep 1547 - 25 Feb 1550 Parma is annexed by the Papal State, Piacenza by Milan. 25 Feb 1550 Duchy of Parma independence re-established. 25 Feb 1550 - 20 Jan 1731 Under the Farnese dynasty. 25 Feb 1550 Duchies of Parma and Piacenza (independence restored). 20 Jan 1731 Ruling family extinct. 25 Jan 1731 - 29 Dec 1731 Austrian occupation. 29 Dec 1731 Parma (and Piacenza) handed over to Borbone heir. 28 Apr 1736 Ceded to Austria (by Austria-France peace treaty of 3 Oct 1735). 28 Apr 1736 - 18 Oct 1748 Under Austrian Habsburg rule. in Parma on 9 Mar 1749. 1 Nov 1802 Under French administration. 24 Apr 1808 Former second consul of France made nominal duke. 24 May 1808 Annexed by France as the département Taro. 14 Feb 1814 - 2 Mar 1814 Austrian occupation. 2 Mar 1814 - 9 Mar 1814 French re-occupation (in Piacenza to 27 Apr 1814). 9 Mar 1814 - 11 Apr 1814 Austrian occupation. France by peace treaty (effected 6 Jun 1814). 10 Feb 1831 - 8 Aug 1831 Rebellion in Parma, duchess relocates to Piacenza. 17 Dec 1847 Pontremoli annexed. 17 Dec 1847 Inherited by Borbone family on death of the duchess. 14 Feb 1848 - 20 Mar 1848 Austrian troops stationed in Parma. 11 Apr 1848 Separate provisional governments in Parma and in Piacenza. 18 Apr 1848 Duke goes into exile. 12 May 1848 - 12 Aug 1849 Pontremoli annexed by Tuscany. 30 Jun 1848 - 17 Aug 1848 Parma annexed to Sardinia-Piedmont. 17 Aug 1848 - Mar 1849 Austrian occupation. Mar 1849 - 5 Apr 1849 Sardinian occupation. 25 Aug 1848 Duchies of Parma and Piacenza (restored). 17 Jun 1859 - 18 Aug 1859 Administered by Kingdom of Sardinia. 18 Aug 1859 Parma and Piacenza joined with Modena. 11 Sep 1859 Duke deposed by parliament. 12 Sep 1859 Annexed by Sardinia-Piedmont. 8 Dec 1859 Part of the Emilian Provinces (see Modena). 1126 Piacenza a free commune. 1271 - 16 Jun 1281 Piacenza occupied by "Sicily" (Naples). Oct 1311 - 18 Feb 1312 Imperial administration. 10 Sep 1313 - 9 Oct 1322 Piacenza occupied by Milan. 9 Oct 1322 - 25 Jul 1335 Piacenza under Papal States rule. 25 Jul 1335 - 15 Dec 1336 Piacenza briefly independent. 15 Dec 1336 Piacenza part of Milan. 15 Sep 1447 - 16 Nov 1447 Venetian rule ((by voluntary submission). 16 Nov 1447 Piacenza re-incorporated into Milan. 24 Jun 1512 - 23 Sep 1545 Piacenza part of Papal State (ratified by treaty 8 Oct 1512). 23 Sep 1545 Duchy of Piacenza (ruled by Parma) created by Papal bull. 12 Sep 1547 - 19 Oct 1556 Spanish rule over Piacenza (under Milan). 19 Oct 1556 Ceded to Parma (Duchy of Piacenza re-established). 29 Dec 1731 - 3 Oct 1735 Piacenza nnd Parma handed over to Borbón heir. 28 Apr 1736 Ceded to Austria (by Austria-French peace treaty of 3 Oct 1735). 28 Apr 1736 - 18 Oct 1748 Under Austrian rule. in Piacenza on 6 Mar 1749. 7 May 1796 - 30 Apr 1799 Piacenza occupied by France. 1 Nov 1802 Piacenza and Parma under French administration. 24 Apr 1808 Former third consul of France made nominal duke. 24 May 1808 Annexed by France (as part of the département Taro). 2 Mar 1814 - 27 Apr 1814 French re-occupation. France by peace treaty, effective 6 Jun 1814 . 22 Mar 1848 Separate provisional government set up for Piacenza. 10 May 1848 Piacenza votes by plebiscite to join Italy. 2 Jun 1848 Piacenza annexed to Sardinia-Piedmont. 17 Aug 1848 - 16 Mar 1849 Austrian occupation. 16 Mar 1849 - 6 Apr 1849 Sardinia-Piedmont administration. 6 Apr 1849 - 25 Aug 1849 Austrian administration. 25 Aug 1849 Duchies of Parma and Piacenza (restored). 17 Jun 1859 - 18 Aug 1859 Administered by Sardinia-Piedmont. 18 Aug 1859 Piacenza joined with Modena. 8 Dec 1859 Part of Emilian Provinces (see under Modena). 18 Mar 1860 Incorporated into Sardinia-Piedmont. 996 - 1106 Papal State rule. 1106 - 1137 Pesaro a free commune. 1137 - 1168 Papal State rule. 1168 - 1178 Pesaro a free commune. 1178 - 1198 Papal State rule. 1198 - 1200 Imperial rule. 1200 - 1210 Papal State rule. 1210 - 1216 Imperial rule. 1216 - c.1242 Pesaro a free commune. c.1242 - 1250 Imperial rule. 1250 - 1285 Papal State rule (occupied by Naples 1259-1266). 1304 Lordship of Pesaro under Rimini led by Malatesta family. Aug 1306 - 1324 Papal State rule. 1330 - 3 Jun 1334 Papal State rule. 3 Jun 1334 - 25 May 1343 Restored to Rimini under Malatesta family. 25 May 1343 Given to the son of the ruler of Rimini. 2 Jun 1431 - 24 Sep 1433 Papal State rule. 18 Jan 1445 Sold to the Sforza family. 28 Oct 1500 Ruler excommunicated and Pesaro ceded to Romagna. 28 Oct 1500 - 3 Sep 1503 Papal occupation under Cesare Borgia, duca di Valentino. 1 Jan 1514 Acquired by Urbino (by Papal bull of 20 Feb 1513). 1 Jan 1625 Under rule of Papal State. 12 May 1631 Formally annexed to Papal State. c.1013 - 1399 Part of Pisa. 1404 - 1463 Under the suzerainty of Florence. 1463 - 1799 Under the suzerainty of "Sicily" (Naples). 3 Sep 1501 - Sep 1503 Papal rule under Cesare Borgia, duca di Valentino. the suzerainty of Spain (from 1735, "Sicily" Naples). 22 Jun 1548 Sold to Florence. 24 Jul 1548 - 12 Aug 1552 Occupied by Spain. restore Piombino in due time. 20 Feb 1603 - 31 Oct 1611 Occupied by Spain. 10 Apr 1628 - 20 May 1634 Occupied by Spain. 20 Mar 1631 Given to Niccolò Ludovisi, imperial diploma effective 20 May 1634. 8 Oct 1646 - 18 Jul 1650 French occupation, prince continues reign. 3 Oct 1735 Under the suzerainty of "Sicily" (Naples). 7 Sep 1796 - 15 Apr 1797 British occupation, prince continues reign. 27 Mar 1799 - 9 Jul 1799 French occupation. 28 Mar 1801 "Sicily" (Naples) renounces all rights to Piombino and Elba. 24 Sep 1803 Annexed to France by decree (dated 15 Jul 1803). 3 Mar 1809 Attached to, but not annexed to, Tuscany (which is part of France). 12 May 1814 - Apr 1815 Austrian occupation (administered from Lucca). Apr 1815 Annexed to Tuscany . Apr 1331 - 22 Sep 1333 Papal rule. 1 Jan 1315 - 1 Jan 1334 Cesena annexed. 22 Oct 1378 - 20 Nov 1465 Cesena annexed. 10 Oct 1500 - 6 Sep 1503 Papal rule under Cesare Borgia, duca di Valentino. 16 Dec 1503 - Jun 1509 Occupied by Venice. Jun 1509 - 24 May 1522 Papal rule. Mar 1523 - 14 Jun 1527 Ruled by Urbino. 17 Jun 1528 Annexed to the Papal State. 3 Feb 1479 County of Rodigo separated from Mantua. 5 May 1565 Marquisate of Sabbioneta, independence from Mantua. 1702 Annexed to Duchy of Mantua. 1707 Ceded to Duchy of Guastalla. 1747 Annexed to Duchy of Milan (see Lombardy). 1341 - 1344 Naples intervenes in succession dispute in favor of Manfredo V.
voided on 9 May 1376. 7 Apr 1487 - 20 Aug 1490 Occupied by Piedmont. 28 Mar 1537 - 3 Nov 1537 French occupation. 29 Jun 1543 - 24 Mar 1544 Spanish intervention, marchese imprisoned. 23 Feb 1548 - 29 Jul 1548 French occupation. 29 Jul 1548 Annexed by France. 28 Sep 1588 Annexed by Savoy-Piedmont (ratified 17 Jan 1601). 17 Jan 1601 Formally ceded to Savoy-Piedmont by France. 16.. - 30 May 1631 Occupied by France. c.1800 BC - c.500 BC Nuragic civilization. c.510 BC - 238 BC Colonized by Carthage. 456 - 469 Part of the Vandal kingdom. 469 - c.474 Part of the Roman Empire. c.474 - 533 Part of the Vandal kingdom. (Torres) and Arborea, and later Cagliari and Gallura. c.687 - c.807 The iudex (giudice) of Cagliari is usually styled Judex sive rex. 711 Brief Arab invasion captures Cagliari and nearby coastal regions. called iudici ("judges") began to govern autonomously. 1015 - 1016 Parts of Sardinia occupied by the Caliphate of Qurtuba (Córdoba). 10 Aug 1164 Barisone II, iudex (giudice) of Arborea, and later Guelfo (a "Guelph"
Sardinia") by Holy Roman Emperor Friedrich I in Pavia. the Archdiocese of Pisa is the sovereign of the whole island. 1284 Torres is annexed by Genoa. of Aragón, he accepts the offer in 1303. 1298 One-third of Cagliari is annexed by Pisa. 1308 One-third of Cagliari, and Gallura are annexed by Genoa. 12 Jun 1323 Jaume II of Aragón occupies Cagliari, Gallura, and Sassari. remain kings of Sardinia until 1708. 1355 The remaining third of the Giudicato of Cagliari becomes extinct. 20 Jun 1478 The Giudicato of Arborea becomes extinct. 13 Aug 1708 - 30 Sep 1717 Austrian Habsburg rule under Carlo (VII) Giuseppe Francesco. 30 Sep 1717 - 17 Feb 1720 Spanish occupation. 27 Nov 1792 - 25 Apr 1814 Savoy and Nice (from 4 Jan 1793) annexed by France. 28 Apr 1796 - 28 May 1799 Piedmont occupied by France. 28 May 1799 Piedmont re-incorporated into Savoy monarchy. 23 Jun 1800 - 25 Apr 1814 Piedmont occupied by France (annexed from 11 Sep 1802). 20 Dec 1814 Genoa annexed to Sardinia-Piedmont. 30 Nov 1859 Lombardy annexed by Sardinia-Piedmont. 18 Mar 1860 Annexation of Guastalla, Parma, Modena, and Romagna. 22 Mar 1860 Annexation of Tuscany. 2 Aug 1860 Counties of Savoy and Nice ceded to France. 17 Dec 1860 Annexation of Umbria, the Marches and Two Sicilies (Naples, Sicily). ¹full style of rulers 1815 - 1860: Per la grazia di Dio Re di Sardegna, di Cipro e di Gerusalemme, Duca di Savoia, di Genova, di Monferrato, d'Aosta, del Chiablese, del Genevese e di Piacenza; Principe di Piemonte e d'Oneglia; Marchese d'Italia, di Saluzzo, d'Ivrea, di Susa, di Ceva, del Maro, d'Oristano et di Sezana; Conte di Moriena, di Ginevra, di Nizza, di Tenda, di Romonte, d'Asti, d'Alessandria, di Goceano, di Novara, di Tortona, di Vigevano e di Bobbio; Barone di Vaud e di Faussigny; Signore di Vercelli, di Pinerolo, di Tarantasia, della Lomellina e della Valle di Sesia, ec. ("By the grace of God, King of Sardinia, of Cyprus, and of Jerusalem, Duke of Savoy, of Genoa, of Montferrat, of Aoste, Chablais, Genevois, and of Piacenza; Prince of Piedmont and Oneglia; Margrave in Italy, of Saluzzo, Ivrea, of Susa, of Ceva, of the Maro, of Oristano, of Cesana, and of Savona; Count of Maurienne, of Genève, of Nice, of Tenda, of Romonte, of Asti, of Alessandria, of Goceano, of Novara, of Tortona, of Vigevano and of Bobbio; Baron of Vaud and of Faucigny; Lord of Vercelli, of Pinerolo, of Tarentaise, of the Lomellina, and of the Valley of Sesia, etc."). March of Turin [Marcha di Torino]) founded. union fully effected upon the death of Adelaide on 19 Dec 1091). 1092 - 1130 Bishop of Turin holds title of count of Turin. 1136 - 1191 Bishop of Turin holds title of count of Turin. under the suzerainty of Savoy)(Contea di Piemonte). (remaining under the suzerainty of Savoy). upon marriage (effected by charter 23 Feb 1301). 27 Jan 1360 - 2 Jul 1363 Confiscated by Savoy. the main line of the house of Savoy. 1 Apr 1536 - 7 Feb 1563 Piedmont occupied by France (largely annexed to France Jun 1538). becoming the seat of government. 1744-45 by Spain; 1649-1672 by Genoa; from 4 Apr 1796 by France). county of Nice and the county of Tenda. 12 Apr 1796 - 28 Apr 1796 Piedmont occupied by France. 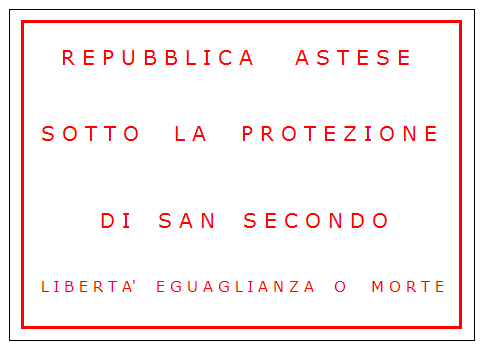 seize power and proclaim the Republic of Alba (Repubblica di Alba). 28 Jul 1797 - 30 Jul 1797 Revolutionaries in the municipality of Asti declare a republic. 12 Dec 1798 Piedmontese Republic (Repubblica Piemontese). 28 May 1799 - 23 Jun 1800 Re-incorporated into Savoy monarchy (Kingdom of Sardinia, etc.). 27 Jun 1800 Piedmontese Republic re-proclaimed. 1800 Renamed Subalpine Republic (Repubblica Subalpina). 19 Apr 1801 Occupied by France. Sésia, Stura, and (to 1805) Tanaro (see below). Annone to the consuls of the city (Republic of Asti). 26 Sep 1339 Occupied by Monferrato. 14 Aug 1342 Part of the Duchy of Milan. 24 Jul 1797 Revolutionaries take control of municipal government of Asti. 28 Jul 1797 Revolutionaries proclaim independence of the "Republic of Asti"
(Repubblica Astese or Repubblica di Asti). 30 Jul 1797 Forcefully dissolved by Piedmont-Sardinia. 26 Aug 1802 French département Doire (Forêts la Doire). 26 Aug 1802 French département Marengo. département Gênes (see Genoa); Asti attached to Marengo. 26 Aug 1802 French département Éridan. 20 Sep 1802 Renamed département Pô. 1813 End of French rule. 26 Aug 1802 French département Sésia. 26 Aug 1802 French département Stura. 6 Jun 1805 Annexation of Alba from Tanaro. 24 Apr 1801 Tanaro département established. 26 Aug 1802 Annexed to France. of Marengo, Stura and Montenotte (see Genoa). 1003 County of Aosta (Contea d'Aosta) is given to Umberto "Biancamano"
by Heinrich II King of Germany. Chablais, Piedmont and other possessions in the northern Italy. adjacent Piedmontese lands of the Turin March (ratified 1046). (confirmed by diploma 11 Jun 1313). 1311 Aosta and Chablais elevated to duchies by Emperor Heinrich VII. and is made immediate within the Holy Roman Empire. 1387 Marquisate of Clavesana part of domains of the Count of Savoy. Savoy (for Nice see under France provinces). raised to a principality on 15 Aug 1424.
of the Duke of Savoy. part of Dauphiné), returned by the Treaty of Cateau-Cambrésis. (Asti is occupied by Spain 1637-1643 and France 1703-1707). agreement of 16 Nov 1575). 28 Sep 1588 Marquisate of Saluzzo annexed by Savoy (by treaty on 17 Jan 1601). Savoy by the Treaty of Cherasco. di Gerusalemme ("King of Cyprus, and [from 1713] of Jerusalem"). 8 Apr 1676 County of Desana incorporated into domains of House of Savoy. 5 Jul 1708 The remainder of Montferrat and Alessandria pass to Savoy. as agreed by treaty on 13 Aug 1713.
the possessions of the House of Savoy. 21 Sep 1792 Savoy occupied by France. 27 Nov 1792 Savoy annexed by France. 20 Oct 1793 Savoy incorporated into France as the département of Mont-Blanc. 25 Apr 1814 Re-incorporated into Savoy monarchy (Kingdom of Sardinia, etc.). 30 Nov 1847 Duchy of Savoy is fully incorporated into Kingdom of Sardinia. 2 Aug 1860 County of Savoy ceded to France. 16 Sep 1947 County of Tende (Tenda) ceded to France. 21 Sep 1792 Chambéry, the main city, is occupied by French troops. 27 Nov 1792 French département Mont-Blanc formed from Savoy. 30 Apr 1815 Western Savoy is restored to Sardinia.